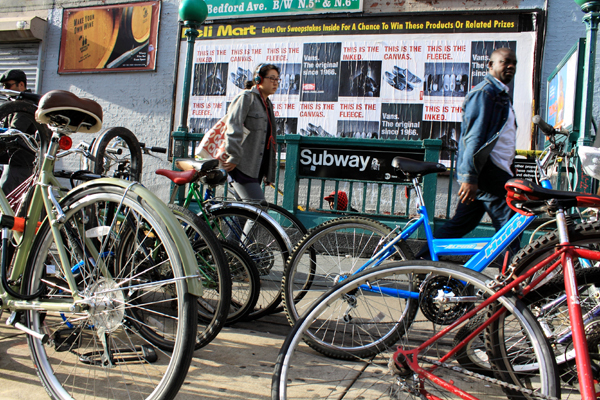 The morning commute in Williamsburg, Brooklyn, a neighborhood where community wishes clashed with city development plans. It was hard not to be impressed by the December 2006 rollout for Mayor Bloomberg’s PlaNYC 2030 initiative. Guests who took the subway out to Flushing were carted via trolley-bus to the stunning Queens Museum of Art. The crowd of dignitaries, advocates and reporters packed the floor of an exhibition hall and flowed onto a mezzanine above. A slick multimedia presentation accompanied the mayor’s remarks, and the former NBC News anchor Tom Brokaw oversaw a panel discussion after Bloomberg spoke. The mayor himself was masterful, weaving together civic confidence, moral purpose and self-deprecating humor. And how sweeping his vision was: carbon emissions reduction, affordable housing, new parkland, better transit and cleaner water. There was just one problem: PlaNYC wasn’t actually a plan. Nor was it meant to be one. No shock there. As the new issue of City Limits magazine reports, real planning is not something New York City has ever done. Other major cities have drafted comprehensive plans that linked land development to transit improvements and government services. But New York has always relied on zoning, which creates rules for what the private market can build, rather than planning. Some attribute this to the city’s political complexity, others to the power of the local real estate industry. Many argue that New York is too spontaneous a place for a plan. But there are growing calls to re-examine those assumptions. Pitched battles over recent redevelopment plans—from Atlantic Yards to Manhattanville—have fueled a fervor for more community input into how the city grows. Developers face lengthy environmental reviews that can increase the cost and alter the marketability of a project. Deals in which builders offer benefits in exchange for community groups’ support are under increasing legal and political scrutiny. New York, with a transit system strained by growing ridership and crumbling finances, is struggling to compete with other cities in offering a greener and more efficient commute. In “City Without A Plan,” City Limits looks at the past, present and possible future of planning in New York, with reporting from the South Bronx to the Brooklyn waterfront to suburban Staten Island. What’s more, Portland, Ore., just devoted two years to the kind of public-input process for its comprehensive plan that New York City spent three months doing in early 2007 for PlaNYC. Getting citizen buy-in can be messy, but the lack of it can also be a mess: PlaNYC’s signature policy, congestion pricing, died in 2008 from a severe lack of public support. As the 100th anniversary of the Triangle Shirtwaist fire approaches, one artist captured the tragedy&apos;s scale by sending letters to the dead. At a local museum, a community bears witness to the black experience on Staten Island, as some of its last remaining historic structures are landmarked.